With a population of over 20 million, the country faces the ocean on one side. The other side faces the Lake Malawi that forms a vague border with Zimbabwe and Malawi. In this trip, we will first travel to the seaside of Mozambique. Then, we will visit the back part of the country facing the lake in our later Malawi trip, where we will see that on both sides, life is almost the same. In the first part of our trip, we set off early with our four wheel drive from our house in Durban, South Africa with all preparations done to avoid being stranded. In this journey we intended to see Mozambique- at least the southern parts- and to experience a jeep safari. We broke a record by making three border crosses on the same day, also passing through Swaziland, which is a very small country in the middle of South Africa. In the afternoon, we arrived in Maputo, the capital city in the south of Mozambique with a population of around 1.5 million. What happens when waters ebb in Mozambique? 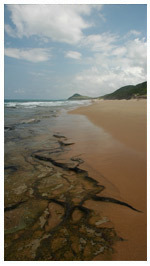 Due to strong tides in Mozambique, sea water ebb in the morning around this island and flow in the afternoon. It is so amazing that the water ebb several kilometres away from the shore in the mornings. In fact on all shores of the Indian Ocean in Africa, this phenomenon occurs, particularly in the islands in certain seasons. Also in the Inhaca Island, boats strand on the bay where we swam the previous day. This is especially good for fishermen. In some places they walk in the shallow water up to the shore and easily catch fish and shellfish with nets. They exchange these sea products with the goods from the city. Shoppers are generally women who load the huge fish heads they bought from fishermen to bowls which they carry on their heads. They bring these bowls to the boats waiting on the quay. They buy food, clothes, oil, gas, bicycles, and even big batteries from these boats. Fish and shellfish caught in the ocean are taken to the fish market which we later visit. In the second part of our travel, we return to the mainland and drive towards the border of South Africa. We will spend the night on another heavenly and isolated corner of the country. But until we get there our adrenalin keeps high due to the roads we pass with our four wheel car, endless bumps of sand, non-four wheel cars and trucks that are stranded due to rain, which we pass at high speed since we are scared to stop and get mired. The lodge that we arrive in the evening is a place consisting of wooden barracks amid an endless beach and lush nature. Here we swim in the ocean and become one with the ocean by body surfing (leaving your body to the waves and swimming to the shore on these waves)… It is wonderful to wake up to the sounds of waves and birds… When we went exploring the other night with torches, we were not able to see the turtles coming ashore to leave their eggs but during our morning walk we were lucky to count 23 turtle footprint and nest! On the way back, we struggled on the roads while rain poured down constantly and our car was drenched in mud; we return home satisfied that we had a real jeep safari experience.